Crawley Town have made the first significant move in the fight to secure Gavin Whyte's signature this summer. Several cross-channel clubs have been impressed by the Crusaders winger's form this season but the League Two side are the only club who have made an offer to date. Town, who are managed by former Liverpool and Leeds United ace Harry Kewell, have made a sizeable verbal offer and appear keen to net the man from the Markets who has just scooped the Player of the Year and Young Player of the Year prizes at the NI Football Awards. Former Linfield boss and Northern Ireland international Warren Feeney is Kewell's assistant and keeps a close eye on the Irish League's promising young talent. League One side Doncaster Rovers, managed by Sir Alex Ferguson's son Darren, and Championship outfit Leeds United are also understood to be interested but haven't made an offer yet. 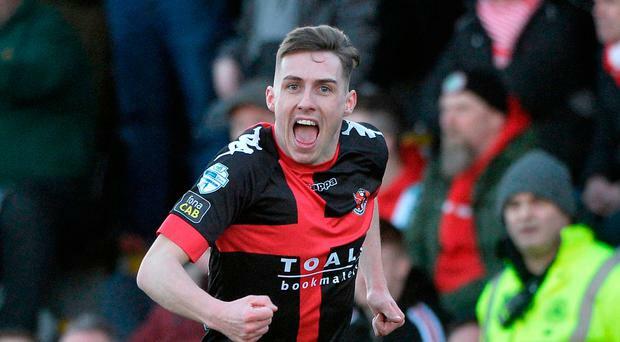 Whyte, who could be called into Michael O'Neill's Northern Ireland squad for the tour of Central America, appears set to seal his dream move to the full-time game this summer after helping the Crues win back the Danske Bank Premiership title. Crusaders are currently rewarding their players with fresh contracts while goalkeepers Brian Jensen and Michael Dougherty as well as strikers Mikel Suarez and Darren Murray have left the club. Meanwhile, former Crusaders midfielder Richard Clarke has been released from his contract at Ballinamallard United following their relegation from the Danske Bank Premiership. The 32-year-old, who has also had spells with Omagh Town, Newry City and Glentoran, asked to leave the club in order to pursue options in the top tier following the Mallards' drop down to the Championship. Clarke made 27 appearances for Ballinamallard last season and was a mainstay in the centre of midfield. The Ferney Park club posted on Twitter: "Following attempts by manager (Harry McConkey) to persuade Richard Clarke to remain playing for (Ballinamallard), he has indicated his desire to continue playing Irish Premiership football. "Although disappointed, the club will agree to his request to release him from his contract." Championship side Ballinamallard will play in the Irish Cup final after beating Warrenpoint on penalties at Mourneview Park. By Adrian Rutherford At 41, John Connolly must have thought his dreams of Irish Cup glory were gone. Crusaders will travel to Linfield after they beat Glentoran to seal their spot in the Tennent's Irish Cup sixth round. By Gareth Hanna It's one of the biggest days in the Irish League calendar - Tennent's Irish Cup fifth round draw day with a couple of big ties set for January 5.